Today I’m going to tell you how to make a souffle in the crock pot and my experience making it. I made this recipe with my 14 year old cousin. It’s an easy recipe and it’s safe with the crock pot. Why is it safe? Kids learning to cook doesn’t splash or stir the ingredients everywhere. You can leave the crock pot on for long amounts of time without it becoming overly hot. Tell your children to stay away from the sides. Even though it is safer, the sides do still get hot enough to burn fingers getting too close. I decided to cook my souffle with dark chocolate. 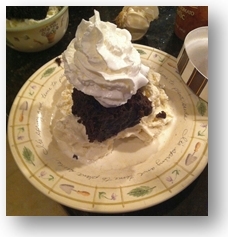 The dark chocolate caused the souffle to be slightly bitter, but when you add ice cream and whipped topping, the souffle tasted great! If you want it to be sweeter then use milk chocolate. There were very few challenges to making the souffle. One thing that didn’t turn out too well were the edges. The edges got burnt and didn’t taste good. I think if I were to make this again I would put Tin foil around the edges. If it burns then just cut off the edges and don’t eat them. Spray interior of slow cooker with a nonstick spray. Put the dry ingredients into a bowl. Stir. Cover and cook on low for 6 hours. DO NOT lift the cover until the end of the 6 hours. Insert a tooth pick into the center of the cake to see if it comes out clean. If not, continue cooking for an additional 15 minutes. Repeat until finished. Serve warm from the cooker with soft serve ice cream.